What do you do when something you own gets broken? We usually try to repair or replace, or, if all hope is lost, we recycle what we can. Things break around us all the time, and this expands beyond mere stuff. We see it in situations and systems, people and our planet, things often far too big for us to try to “fix” on our own. That’s why it’s amazing to consider what God does with broken things, and how He has a remarkable way of working with and through them. When people around Jesus were broken, He could simply touch them or say a word and their bodies and minds would be healed. Yet even that physical healing was pointing toward a greater spiritual healing. All this dysfunction and disrepair actually points to our broken relationship with God. But Jesus was about to repair even this by being broken Himself. Shortly before being arrested, Jesus broke bread in front of His closest followers as part of a Passover meal, telling them it represented His broken body. Days later the Bread of Life Himself was broken on a cross and placed in a tomb. When Jesus stepped out of that tomb 3 days later, well, you might imagine even His closest followers had a hard time believing. As a couple of them were walking home, Jesus caught up and walked alongside. Yet they had no idea it was Him until He did something very familiar, blessing and breaking bread in front of them. Suddenly they knew the once broken Bread of Life was now restored! And if He was restored from death to life, He can restore us too. It really is amazing to see God work with broken things, especially people. Even though we contribute to the mess anytime we choose not to love God or others, He continually invites us to the table, offering something more satisfying than we’ve ever known. For whoever comes to Him, He’s ready to give real life, renew our relationships and even bring us into a fully rebuilt world one day. He sure didn’t have to take on another project, but I’m beyond thankful the Lord continues to work even on a broken mess like me. (“Under restoration,” as I like to say.) And if you haven’t yet accepted the offer, I’d like to invite you to His table to see all the amazing ways Jesus, the broken and restored Bread of Life, is able to multiply, heal, restore and renew. 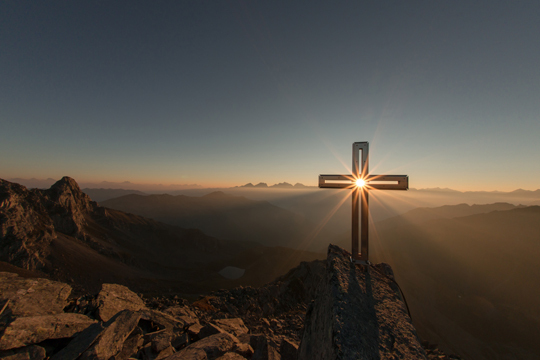 Relentlesly Pursued by "The Hound of Heaven"
I have been overwhelmed lately as I consider God's unrelenting pursuit in my life, and unable to get the concepts of this classic poem, "The Hound of Heaven," out of my head. While my story isn't identical to the opium addicted author's, when the Lord called me to Himself He commanded me to stop pursuing the sin in which I was so entangled. But in part it was a place of comfort, coping, identity and far more He was asking me to give up. So even though I heard His voice distinctly, I didn't want the disruption and tried to fight Him. God, forgive me, I said "no." Little did I know the Lord always wins the wrestling match. As I think on this now, new realizations come to mind. How much must Jesus love me to keep pursuing in spite of this in-His-face denial? It literally turns my stomach now to confess I did not want His love. The notion of "love" never even occurred to me. I simply wanted to go on ignoring Him and live my own life my own way. And yet "no" was not an option here. Jesus will have all the Father has given Him. (John 6:37-40; 17:1-26) He had, in fact, already died even for this betrayal. And though I fled Him, He pursued, and pursues me to this day with a love that will not let me go. O my God, thank you for never giving up, never letting go. This 182 line poem is both lengthy and written in older English, so I share the full text below, but also an intriguing modern adaptation here that may help your understanding. Additionally, here's a version with the text read along in case you're more the auditory type. Keep scrolling and you'll also find the preview for a documentary with a bit more of Thompson's story just after the poem below. Lest having Him, I must have naught beside). In vain my tears were wet on Heaven’s gray cheek. Round the half-glimpsèd turrets slowly wash again. Loneliness, and discussion of it, seem increasingly common in recent years. I often see articles on the subject popping up in news feeds. The "Sunday Morning" television show aired a story about loneliness just this week. England recently appointed a "Minister for Loneliness," and various officials are concerned it may even be a public health epidemic. All this talk and concern while we are more connected to people than ever before, thanks to the state of our technology. But our numbers of "friends" and "likes" online apparently aren't as fulfilling as we might have hoped. For all our texting and tweeting, we somehow remain a society expressing a profound disconnect. 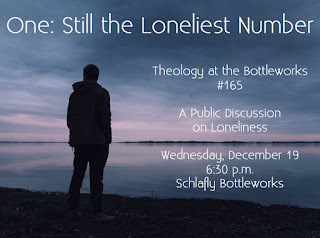 As it happens, this is exactly the kind of topic you might hear about at a monthly public discussion called Theology at the Bottleworks hosted by Midrash St. Louis. TATB is a place to come together for civil discussion of various hot topics in a room full of diverse backgrounds, opinions and views—and a fantastic way to break out of the "one of us" bubble to learn how others process life. So back in December loneliness was the very topic we took on. 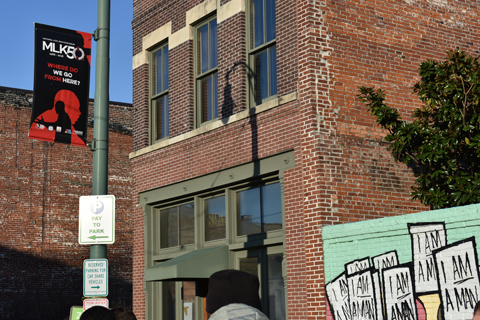 I was able to participate in several additional meetings around the Bottleworks discussion as well, and as it's percolating in my own mind I want to share some related resources and thoughts. "Eight Questions to Address Loneliness"
>> We also did a follow up podcast about the TATB discussion you can hear via Soundcloud. While the causes of and responses to loneliness may vary widely, there should be serious consideration how we as individuals, and Christians/the Church in particular, might better address the issue. So here are some points which developed in and around the conversation. The Lord keeps reminding us, "I'll never leave you," and, "I'm always with you." Jesus pursued His people to His own death. We have to believe this first. Then we can image God by pursuing others. How are we doing here? The sad fact is that many people feel they aren't truly known by anyone. Thankfully, no one knows us better than our Creator, another truth to which we can cling. But when it comes to human companionship, we can dodge depth. We share the day's mood online to rouse responses, then stare at some device in the presence of others rather than spending time in real conversation. Not helpful. Neither is asking, "How are you?," as a greeting and ignoring an honest response. Our knowledge of each other can't grow unless we all move out of the shallow end of the pool. 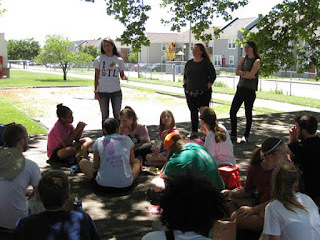 Are we actively interacting? I'm amused at how online curation is often criticized with annoyance that people are just painting the picture of a "perfect" life that's really not. Sure it can happen, but suddenly we're not being "authentic" if we just share our fantastic travel pix without all our bad stuff too, never mind the appropriateness of sharing every detail in the public square. Unfortunately, some have countered with the "authenticity" of chronic complaints or angry opinions... Definitely not better than your lovely vacation photos. Ironically, no matter what persona we post, we do the exact same stuff in person all the time. We always start with a certain public face. No one shows every side of their life in a first or even fifth interchange, nor should we. Too much too soon can push others away. There really is a time to speak and a time to hold that thought. While we can share anything with the Lord anytime, we need patience with ourselves and others to grow in and gauge a relationship before revealing our inmost thoughts and struggles. It takes time to go deeper. Are we willing to put in that time? Another common thread is the need for a place to belong. The places where past generations spent time together aren't as readily available. But the Church again has something unique to offer. We know God is making a new people group, a collection of those who love Him coming from all nations and persuasions. Psalm 68 reminds us God is "father to the fatherless" and "defender of widows." If He really "sets the lonely in families" (NIV) or "settles the solitary in a home" (with others - ESV), then the Church should be that family and home, a welcoming community doing all the above just because we love Jesus and want the people around us to love Him too. Are we fully inviting others in? Do we invite even familiar believers into deeper community? Is the invitation on the Lord's terms or ours? Are we loving as He's loved us? Loneliness is a complex issue, and these are just a few points to process as we think about ways to help the many it affects every day. What other ways can we help ease the sting of loneliness? Feel free to share ideas in comments—and, more importantly, in person! It’s been a year where the next big news story quickly overshadowed the last, so much that late in the year the internet has filled with memes reminding us of major events which seem already forgotten. Through quick and frequent change, I’ve felt an increasing need for a place of stability and rest, and it’s clear I’m not alone. Everyone’s looking for these things in different places and many ways. As I navigated 2018, that kind of rest wasn’t found in entertainment, though we thoroughly enjoyed our share of concerts and such. It definitely was not found in politics, though I do appreciate that right to vote. (And the end of the endless advertising... Who’s with me?) It wasn’t in media (social or otherwise), or the gym, or social gatherings, though there was opportunity to enjoy all those. It wasn’t even found in my own house, though I am thankful for a place to call home. 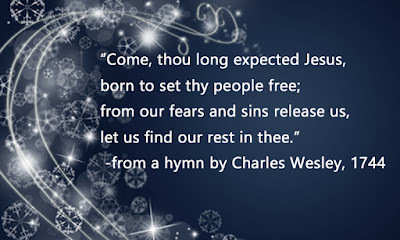 But when the Christmas tunes started rolling out this season, I found myself latching onto the words of the hymn above. Familiar words for me now rang with new hope and invitation. Those words certainly remind us of what’s celebrated at Christmas by looking back to Jesus’ birth. As we’re told, “...when the fullness of time had come, God sent forth his Son, born of woman, born under the law, to redeem those who were under the law, so that we might receive adoption as sons.” (Galatians 4:4–5) From birth to death to resurrection, everything Jesus did was providing His people the way to be free from our fears and sins (“sin” meaning all the ways we ignore God and His law) so we can truly know God and be made part of His family. But the hymn also points ahead. As we trust Him for what He’s already done we can look forward to the next truly big story, the day Jesus will return. “...so Christ, having been offered once to bear the sins of many, will appear a second time, not to deal with sin but to save those who are eagerly waiting for him.” (Hebrews 9:28) His first appearance now makes way for His second, giving hope for a world He will make right again. So whether looking back in celebration or forward with anticipation, the song expresses an invitation for Jesus to “come.” But what’s mind blowing is when He invites us to come to Him. His common invitation is simply, “Follow me.” He persists in inviting with, “Come to me... I will give you rest.” Jesus Himself is that stable place of rest we fail to find anywhere else. 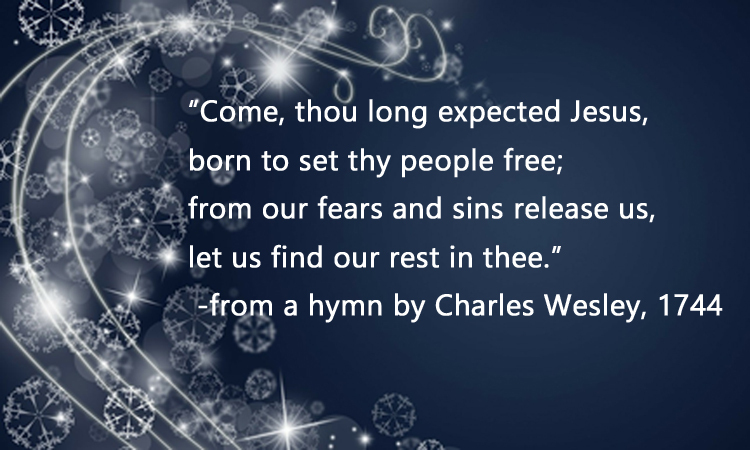 This Christmastime, I invite you to consider who Jesus is and to hear His invitation to you. All the best to you this holiday season! 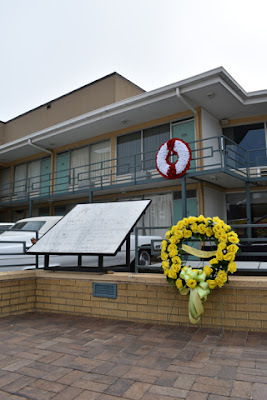 Seeing the Memphis forecast on a stormy April night in 1968, Dr. Martin Luther King Jr. nearly didn't bother to attend a church speaking engagement. He didn't feel well, and given the rain and severe weather he assumed low attendance. 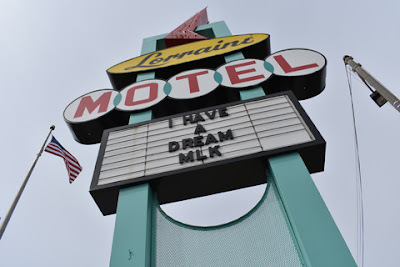 Yet a phone call convinced him to go, and King gave his now famous Mountaintop Speech that evening to an over packed house. Fifty years later to the day, April 3, 2018, the warm Memphis air grew similarly thick outside, with severe weather forecast yet again. But this didn't stop a crowd of about 4,000 gathered in the Memphis Convention Center. 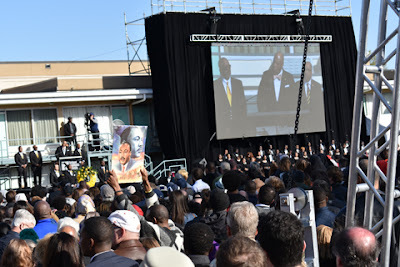 Only this time, rather than anticipating King's arrival, we mourned his passing and joined together to consider his dream of unity, still looking for a greater fulfillment of that proverbial Promised Land. The MLK50 Conference was a 2-day gathering of Christian leaders to reflect on Dr. King's life and work, the Gospel implications of that dream, where we've come and where we need to go from here. I first heard of the event at last year's Gospel Coalition Conference, and knew then I needed to be there. 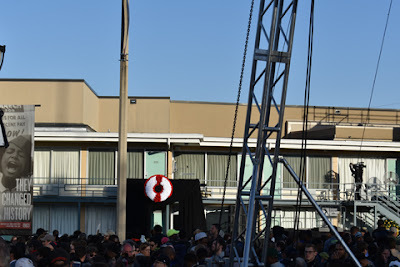 I did not, however, know at that time all the events happening in the city or the sheer number of people who would arrive on April 4, exactly 50 years from the day MLK was shot while standing on the balcony of the Lorraine Hotel—the very day after that great speech. • The Gospel directly impacts every area discussed in racial unity, justice, equity and more. These aren't political issues, they're Gospel issues. Jesus died to bring restoration and make His people one. 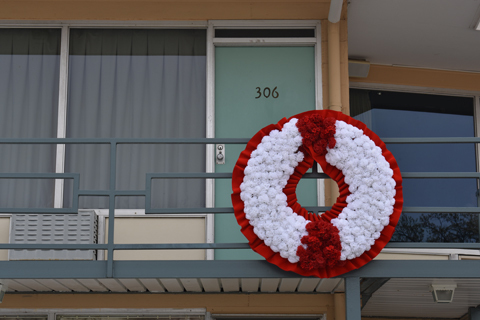 • It's easy to honor people who've died and can no longer speak directly to us. Thankfully, Jesus is alive. We must truly honor Him. • We need to learn from previous generations. Don't ignore the impact of the past on the present. Predominantly white churches need to speak openly and frankly about historic and ongoing systematic issues. • Don't idolize or demonize historical Christian leaders, downplay moral failings of some or intentionally seek to discredit others. We all sin. Jesus deals with His people not according to their behavior but His grace. We never excuse sin, but must see it in context. • We must all repent of any areas in which we claim superiority. Watch out for spiritual blind spots, such as Peter had, and resist cultural individualism. Repentance is necessary for reconciliation. • Take social suffering seriously enough to get involved, and hope seriously enough to stay involved. Don't dismiss, deny or downplay anyone's suffering, especially that of other Christians. • We need to share and sacrifice. If your church has resources another church can use, share with them to increase Kingdom impact. When you can, share resources with area schools. • We need more real relationships. We need to work together. We need to really listen. We need to be able to push each other in uncomfortable ways. • We must love one another. If you don't know where to start, start by simply being nice, in person AND online. • Pray for unity as Jesus did. We don't do unity/diversity for the sake of it, but because of the Gospel. It's also not something we manufacture. We have unity and diversity in Christ. It was no surprise that much of this was so familiar. It's exactly the kind of Gospel understanding the Lord's been developing in me through all the trips and events of recent years, the entire thread of which I continue to share under "Reconciliation & Development." One thing I hadn't processed before this week was that private schools, including those calling themselves "Christian" at the time, largely developed in response to desegregation. If white people couldn't have their own schools, they just created them. Often, this created additional educational disparity and classism in many ways, and among both ethnicities, including white students whose parents couldn't afford private school. A similar story continues to this day in many places. A speaker with a slightly different angle was Trip Lee, sharing the pros and cons of art and music in racial reconciliation. 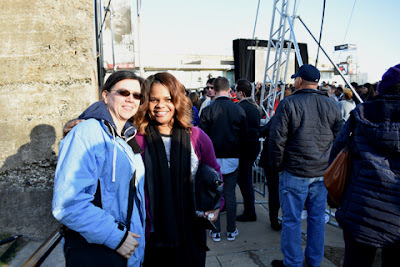 It can be helpful in some ways, such as pushing the conversation forward, but diversity at a concert certainly won't solve the problem, as some have strangely believed. I recommend his talk for more. I was also glad to say a quick hello to "Grandpa" John Perkins, who himself expressed some recognition from our week with him in 2012. I remain grateful for his teaching on forgiveness even for those who preach and practice racism, as this mindset even subtly expressed can invoke great anger in me. Hearing from one who suffered physically at the hands of such men, yet with a clear Gospel response, has been invaluable. I grabbed his new book "One Blood" on its day of release along with some other recent writings. 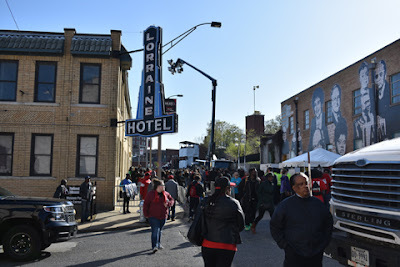 We took a conference break on April 4 allowing time to visit the Lorraine Hotel. 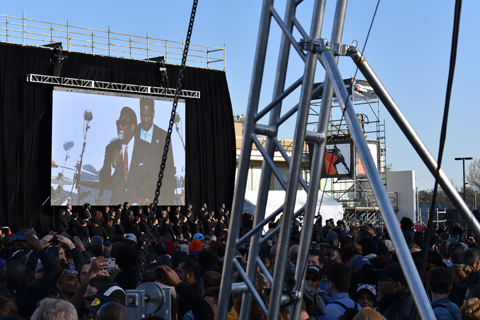 Lots of speaking and singing was happening throughout the day, and that afternoon we made our way through the crowd of thousands attending this and other events in the city. 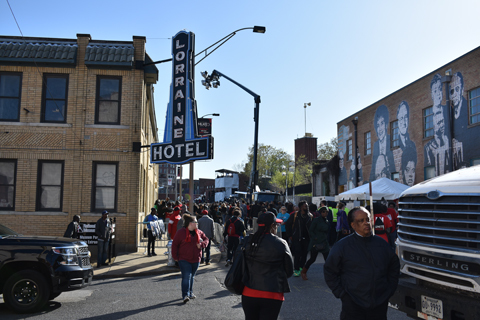 Crowds make their way to and from the Lorraine Hotel. Crowd and media beneath the hotel sign. 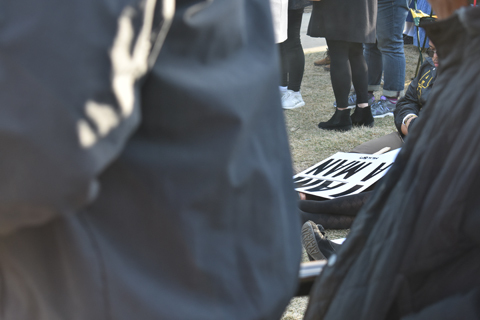 An "I AM A MAN" sign similar to those used during the 1968 Memphis Sanitation Strike following the deaths of two workers. 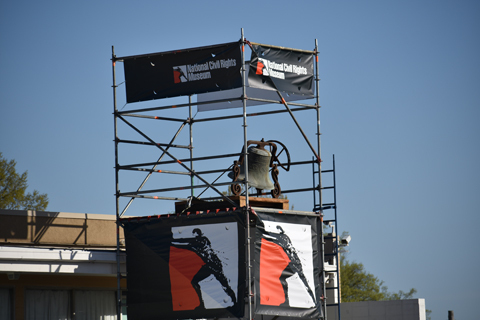 My goal was especially to join the city for a bell ringing ceremony at 6:01 p.m., the precise moment the shot rang out 50 years before. The bell tolled 39 times, indicating King's age at the time of his passing. With all the previous noise and fanfare, the crowd turned respectfully quiet during this time. The red and white wreath was shrouded until the bell tolled. The bell ringing was followed almost immediately by a joyfully jazzy rendition of "Precious Lord, Take My Hand," a gospel song Dr. King requested just moments before the shooting. Al Green performs "Precious Lord, Take My Hand." Before heading back to finish the conference, and as the crowd began to move again, I wanted to grab a photo in front of the hotel. As I was expressing I was not the most important object in the shot, a new friend stepped alongside and said, "We're gonna get a picture together." 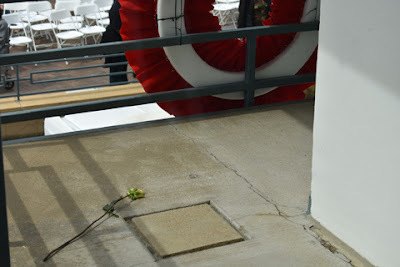 In all the excitement I never learned her name, but we all felt the significance of that little act. A small picture of the dream continuing to grow. MLK50 banner above an "I AM A MAN" street mural on the walk back. 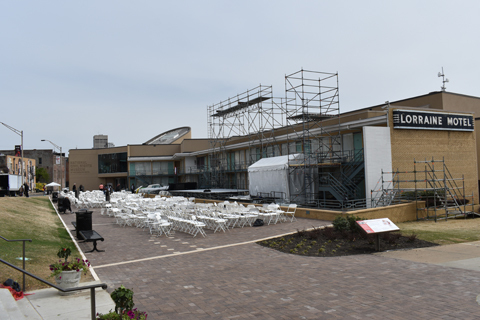 We also took the opportunity to visit the National Civil Rights Museum inside the renovated hotel on April 5. After the massive crowds the day before, the streets felt strangely empty, but the museum had a fair number of visitors also taking advantage of their time here before returning home. This was my second visit to the museum, which underwent significant renovations since our time here in 2012, but it really helped to revisit and give more clarity to all I'd processed in the days, and years, before. The day after. Crews began picking up and tearing down. Still hoping this becomes the true "American Dream." 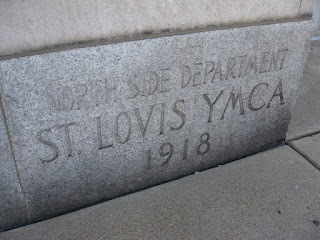 We took a lunch break on Beale (Silky O'Sullivan's, for those keeping score at home) and headed back to finish up on the legacy side of the museum. An announcement soon requested we move to a lower floor, and we were briefly detained due to concerns of some threat. Thankfully, nothing eventful occurred at any time on our trip, but this moment and heavy security all around were constant reminders of the continued vigilance needed in our day. With more unsettling headlines and rampant "opinions" in recent weeks, it seems we remain in the valley, still trying to trudge through, hoping to reach and realize that "Promised Land." But even with all the frustrations and apparent backward steps, many of which have actually prompted the dialogue needed to help move us forward, it's my continued desire to challenge and encourage you as God is teaching me on the way. 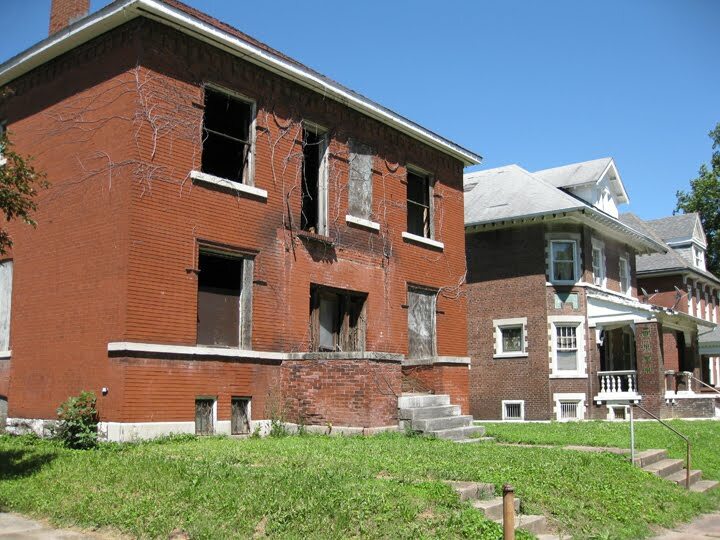 On this stretch of my journey, I'm starting to process areas where I may have benefited from historical events which shaped the St. Louis area and continue to have effects today. This includes my family following the city to county pattern of white migration that left particular regions increasingly impoverished while blocking families from living in others, or how the church where I now find employment moved further into the county from an area which was racially shifting in the 1960s. Those are just a couple examples, but past events affect the present in ways we often don't see, many times because we don't really want to. I'm happy to say the areas of the county where I live and work are now far more diverse, but there's no denying those kinds of movements and motivations continue to create different outcomes for future generations, and this is the reality we're up against today. 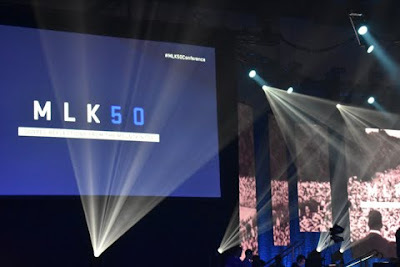 The week's events are also helping me think through ways we as a church are now hoping to address issues of racial unity, economic and educational equity, and more. I'm excited we're having these conversations and trying new approaches, and I pray we stay Gospel focused while pursuing these concerns as best we can. We will stumble, and there must be no savior mentality here. But how can we be servants in these areas, providing real and effective assistance to meet needs? What will it cost us? These are important and prayerful questions we must ask as we move forward. I'll close with an encouragement, similar to one given at the conference. If you are also in this fight, don't give up. I consider there was a time when it would have been dangerous to even snap a photo with our friend above. But change has happened, and changes are happening, slow though they may be. 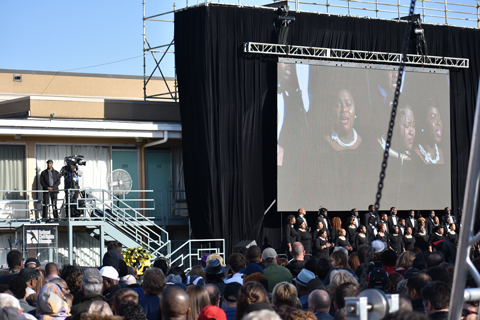 The Lord will continue to work in His Church, and through us into our respective communities. Pray for that, and for those resisting the goal of Gospel unity in various ways. We continue to fight the good fight on all fronts with the glory of God in mind. Even in the valley, in this brokenness, it's still worth dreaming. MLK died looking down in hope from that mountaintop. But Jesus died on Mount Calvary, entered the valley of the shadow of death, and rose again to make a unified people a reality. Through Him, that Promised Land is already ours. Let's show the world His Kingdom here on earth. Since December, I’ve attended several funerals and memorials, being directly involved in two, and even in the presence of one friend’s passing. Many have lost loved ones in our church family and among childhood friends, and I’m aware of others going through similar times of loss, or who have in recent memory. Death isn’t something most of us linger on unless we’re confronted with it in some way, and for good reason. We say it’s “part of life,” but it doesn’t feel right when it hits us. It’s something we all know will happen, but remains impossible to “get used to.” Even if we somehow numb ourselves or explain it away, one day it will sting our emotions again when it becomes personal, for us or someone we love. If we’re honest, death feels like an enemy, because it is. That’s why I’m so excited for the hope celebrated at Easter. Remembering the life, death and resurrection of Jesus Christ gives reason to celebrate the ultimate hope, even in the face of death. In His life, Jesus defeats death by choosing the way of life, living just as God says we should. The rest of us prefer to do things our own way, fracturing our relationships with God and others. This is the hopeless way of separation, and the ultimate separation is death. In His death, Jesus meets death head on. He did nothing wrong. He doesn’t deserve it. But He’s willing to take what we deserve instead, to experience that ultimate separation Himself so, hopefully, we won’t have to. In His resurrection, Jesus soundly defeats death. The enemy is conquered. It can’t keep Him down. And His return to life and restored body shows us a better life might be possible for us. We can have hope for resurrection and restoration as well. Now Jesus invites you and me to His way of life, to a restored relationship with God, to a place where death no longer has its sting or any lasting power over us. Taking that invitation, trusting Him, changes the way we understand life and death, giving a hope that can’t be broken because Jesus, who was broken and died, is very much alive. It’s my prayer that you come to know the hope of life in Jesus in ways you never before imagined. And if you are one of the many who has recently lost a loved one, I pray you’ll find comfort in Him as well. I often share an article about starting a Scripture reading plan, especially around the new year, which you can find here: "Resolved to Read God's Word." This year, I want to share a great resource to help people better understand just what they're reading. The Bible Project has created beautifully illustrated summaries of every book in the Bible, plus lots of series and theme videos to help you understand particular topics. And at this point they're still creating, with much of their content being crowd funded. The site does offer a reading plan, which you can follow via an app, get notifications for by e-mail or even download in print (scroll toward the bottom of the main page for more on this). Below is an intro to their Read Scripture experience for a general understanding of their plan, but you can definitely use their videos to enhance any plan you choose. I've also included the first half of Genesis here just so you can get a feel for their riveting style. Or, go ahead and get started there if that's your pick. However you choose to get reading, I hope these videos are a great help as you get to know the Lord through His Word. People I talk to seem to agree this year’s headlines have felt more than a little jarring. Watching disaster, scandal and tragedy unfold, with something new and often unexpected each week, leaves us wondering what could happen next. The realm of social media seems to argue at every turn of events, seeking someone to blame, making the collective experience that much worse. There’s nothing gentle in the way the world is trending. All this has me considering the unexpected gentleness of what Christians celebrate at Christmas. God Himself comes into the world, very personally present. But He doesn’t come with a great amount of fanfare. There’s certainly some, especially as angels make their announcement, partly quoted above, to initially shaken shepherds, but even this isn’t a widespread broadcast. What’s more, who do they run off to find? A very unintimidating newborn baby. And where do they find Him? Among animals off the beaten path in an overcrowded city, where the family aren’t exactly expecting visitors. Even a few years later when men from the East show up to find the same child, they locate Him by way of astronomy, an unusual celestial event perhaps unnoticed by many. It’s not until they inquire of the local authority that someone takes new notice, and in a jarring act of jealousy tries to end his perceived competition. Clearly if the God of all creation wanted to enter the world, He could have done so any way He chose. Yet He chose this way, coming not as some angry, destroying deity, but one humble and helpless, protected by others in a dangerous world. This is the picture of the Mighty God who is the Prince of Peace, one who grew up like us and can personally relate to us, one who would subject Himself to evil and even death so we could know God. Jesus gives us the ultimate picture of gentleness in a world that’s increasingly jarring. Perhaps more unexpectedly, He invites us to know true gentleness, to know peace through Him, even in our world today. In Matthew 11, Jesus gives an invitation, “Come to me, all who labor and are heavy laden, and I will give you rest. 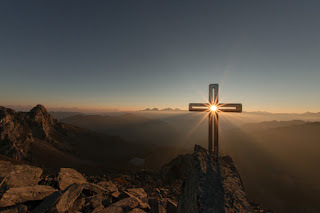 Take my yoke upon you, and learn from me, for I am gentle and lowly in heart, and you will find rest for your souls.” This is far more than just a break from crazy headlines. For anyone who trusts Him, Jesus is offering rest from the weights and struggles each one of us carries inside. To truly know Him is to know peace with God, and to receive all He’s ready to give. Praying this holiday season you discover new hope through the gentleness of Jesus. A couple weeks ago we took a team to serve with Mission: St. Louis. 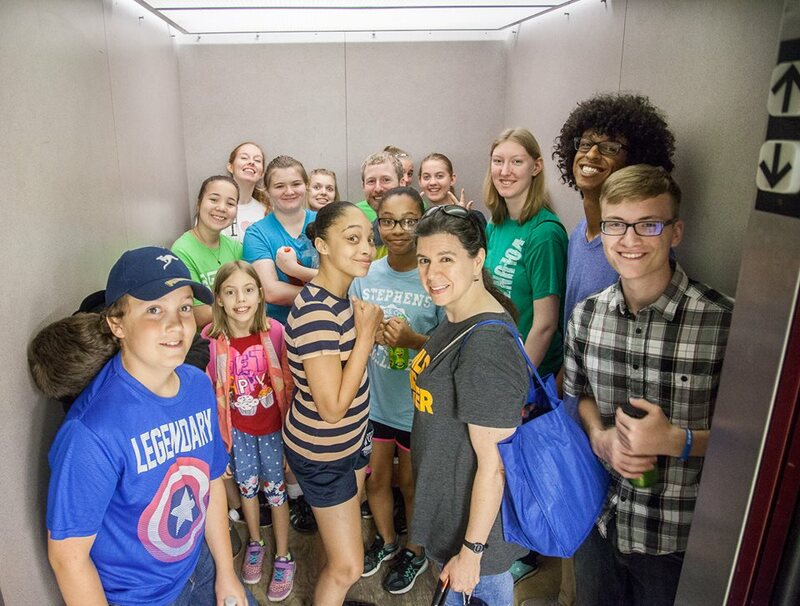 A lot's changed since serving with them in 2014, for the organization and the city, so this provided new opportunities to learn. On our last trip we served in The Grove. Founder Josh Wilson told me that neighborhood gentrified (read: the trendy spots got middle class popular), families they'd connected with moved out and they had to develop a more regional approach. 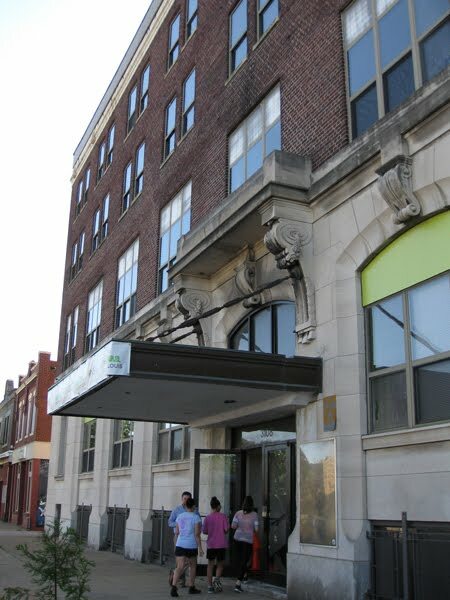 In November M:STL moved into the old YMCA building on Grand Ave. in North City's JeffVanderLou neighborhood, and the former home of World Impact. While they're partially renting with hopes to purchase the structure, they just had a grand opening May 11. 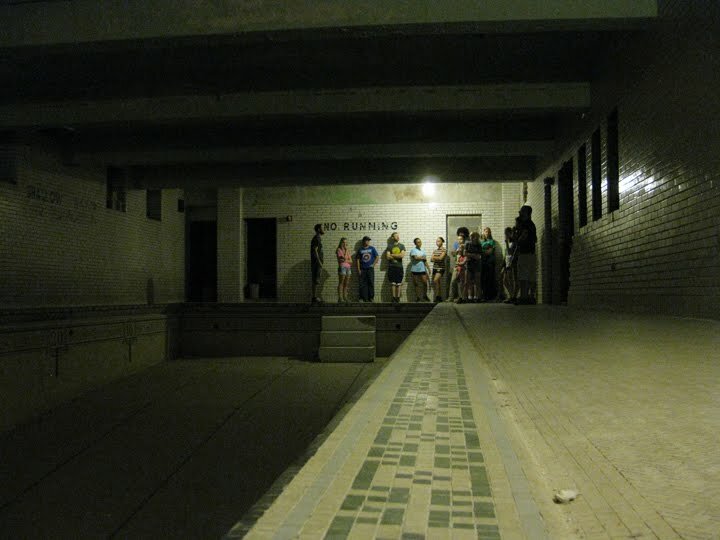 Checking out the classic original pool. This area was once very active and fairly wealthy. The YMCA was built in 1918 across from Sportsman's Park, a former home of the St. Louis Cardinals. 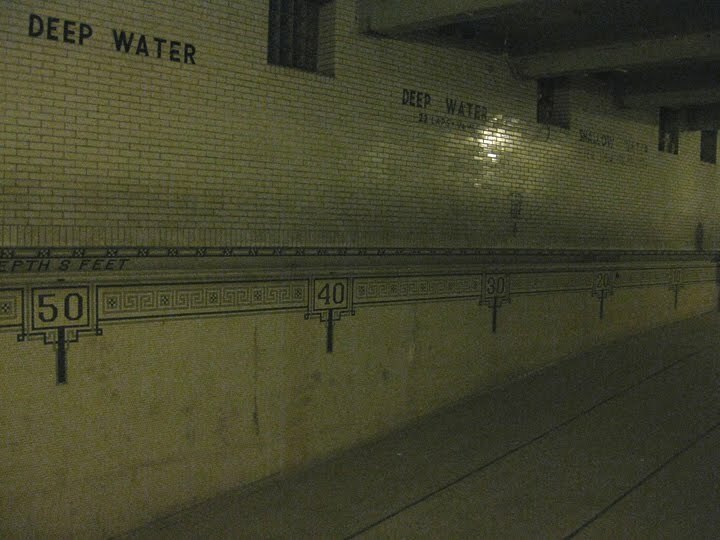 It's near Fairground Park, which has its own intriguing history, including the 1949 race riot when the pool was racially integrated. We also weren't far from Grand Center, a popular arts and entertainment district. On a personal note, my grandparents and at least three great grandparents once lived on streets like Penrose and Kossuth, giving me specific ties to the region. 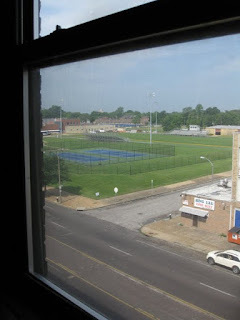 The old Sportsman's Park across the street. It's also an area I've generally learned to avoid, either via negative news reports or stories that if you're white the police think you're only around for illicit reasons. 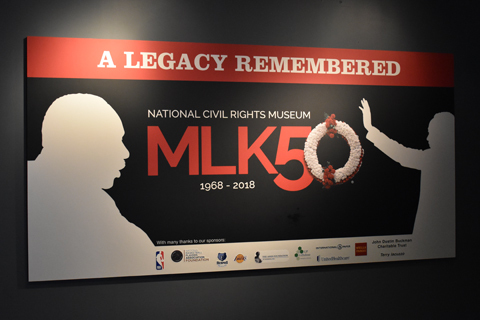 So though we'd often pass this way when I was younger, I hadn't been through in years and was excited to see all this history with an adult understanding. On our first morning we heard from Josh Wilson, who shared how Mission: St. Louis came to be. Josh was once moved by a student's answer to the question of who she'd like to spend time with, dead or alive. She wanted more time with her brother who had died in her arms in their front yard. While this shocked him, he sadly realized it was not shocking to other students, but was reality for many. This motivated him to want to do something in the city. Josh gathered 200 volunteers but quickly burned them out, doing more harm than good in just 3 months by working with a charity model, spewing out resources with no plan or understanding of needs. A principal at Adams Elementary in The Grove helped him better understand this, and a partnership was formed with the school. 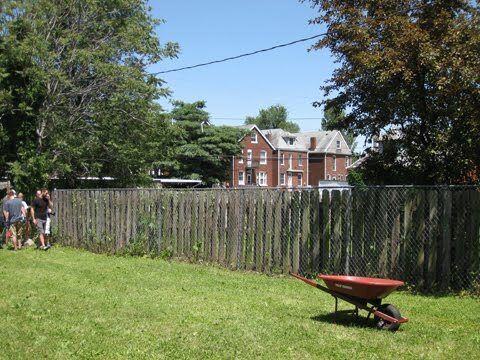 He developed relationships with guys in that neighborhood, and listening to their needs created Beyond Jobs as a bridge between businesses and those who might be considered unemployable due to troubled histories. The hope is to cultivate the next generation, changing families and neighborhoods over time, leading to the healing of our city. Josh said if we understand the Gospel of Jesus rightly, it will change how we view the world and our city. We who are wrecked by our sin and changed by God's grace should want to be part of God's restoration in our world today. Gospel transformation includes being involved, loving culture and city while holding fast to biblical truth. 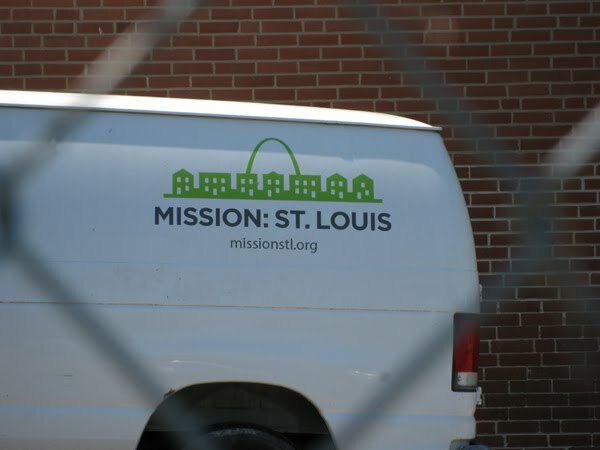 Josh also told us teams like ours are relationship ambassadors for M:STL in the community, plus we would help in the building as they get set up in this 90,000 square foot space. And that we did. 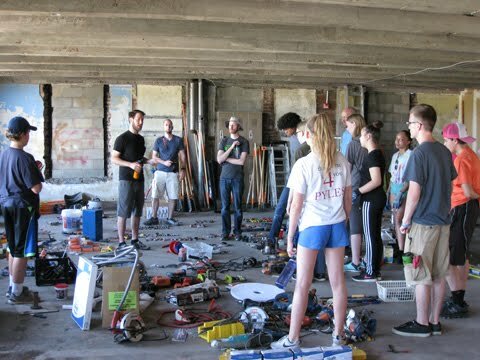 Our guide, Beau, gave us a partial tour and cut us loose to start painting, clearing rooms, and moving an incredible amount of furniture, tools and equipment to different floors. 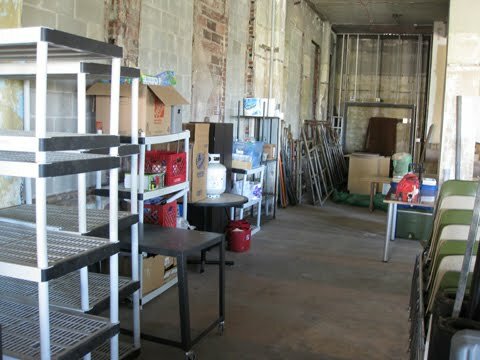 Despite dust and sweat, most of us found this organizational work pretty satisfying. Stuff got put "wherever" during the move. Tools and equipment began being sorted on a higher floor. Later groups will continue to organize and inventory. 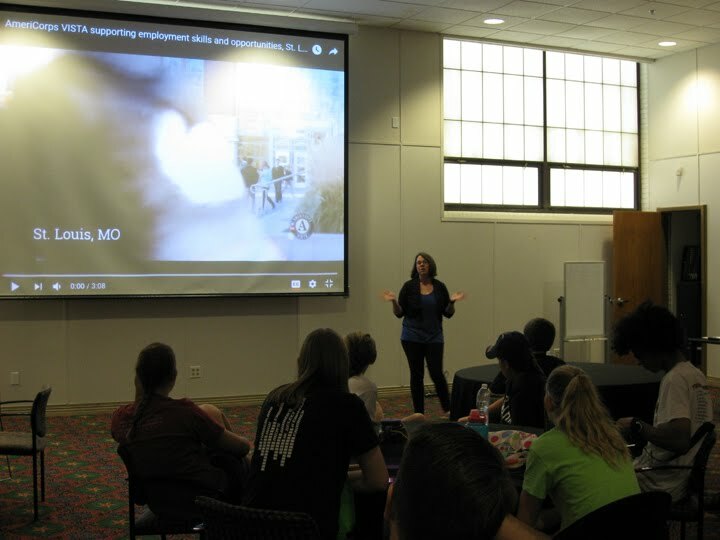 Katie Bench, AmeriCorps VISTA Services Manager, spoke today. 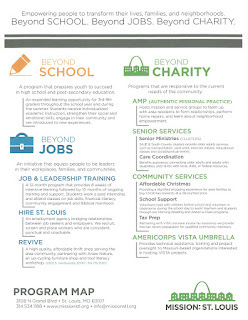 AmeriCorps is the Peace Corps in the U.S. through which M:STL gets many short term employees. Katie, a New Jersey native, quickly noticed the race problem in St. Louis, and primarily discussed some history of systematic issues here. 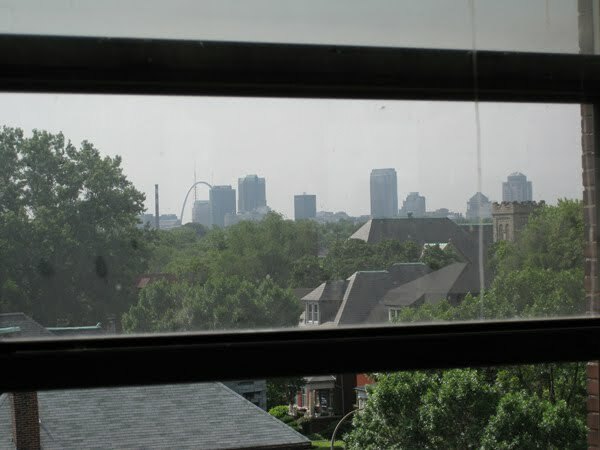 A view of downtown St. Louis and our iconic gateway symbol. Katie then focused on some encouraging areas of change. 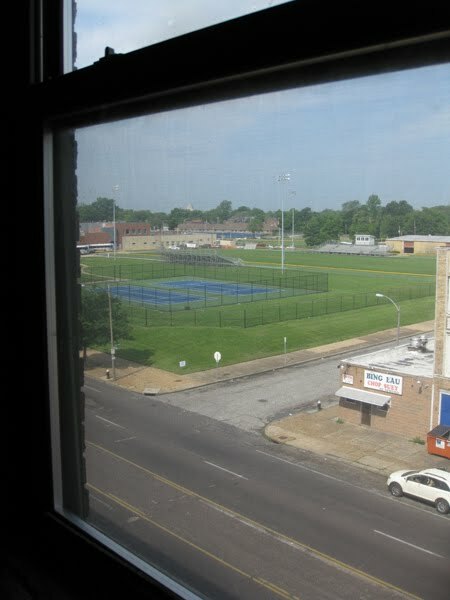 • Schools - City schools are now accredited and doing well financially, but are primarily affected by poverty. Kids often come from less educated families and are not as cognitively ready when they start school. The Beyond School program can help kids gain 3 months of reading skill level for every month a student is involved. 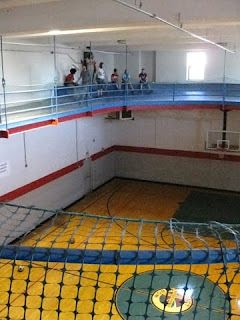 They also provide any physical resources students need. 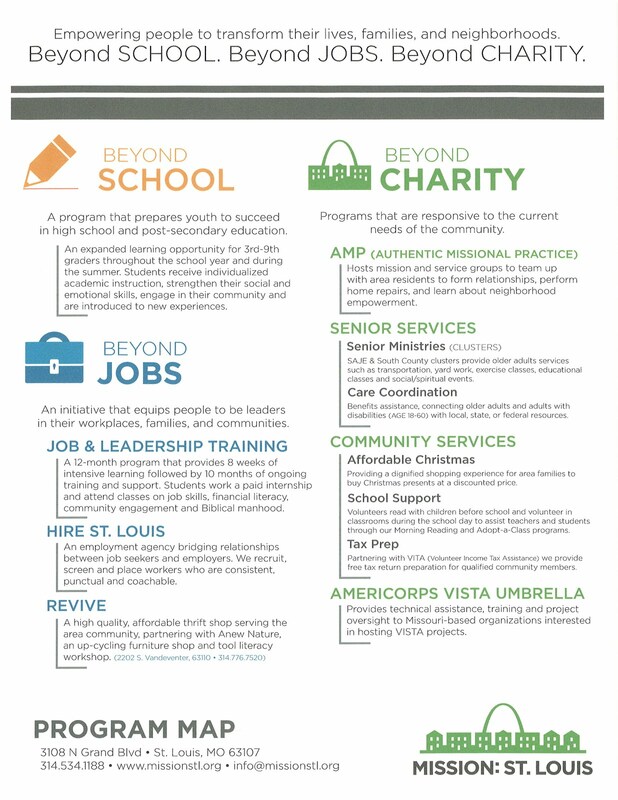 • Economic Opportunity - For those who need employment but did not learn job skills, the Beyond Jobs program provides training. • Food Deserts - Many city areas lack convenient grocery stores. VISTAs are working to get farmers markets in the area to provide better access to fresh fruits and vegetables, while offering food training classes. I was also excited to learn the International Institute has purchased city land to allow farming immigrants to raise crops. 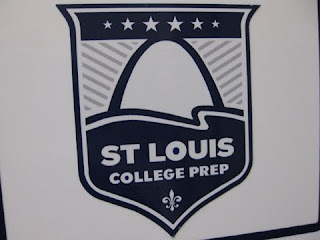 After her talk, the team visited South City to work at St. Louis College Prep, a free charter school for middle and high school students. Executive Director Mike Malone told us when they inherited the building they also inherited a lot of stuff. 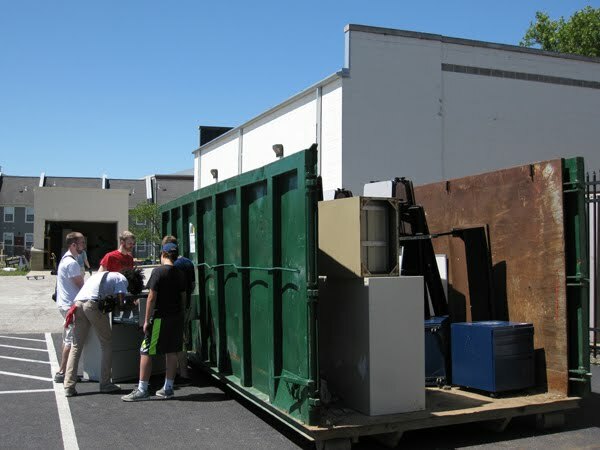 We moved much of that stuff from garage to dumpster, then collected gym equipment to organize in the garage. 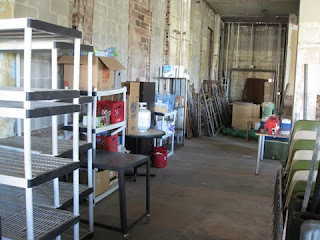 We also hauled things out of their amazing (and deep) boiler room and assembled furniture. Most of the contents of the garage at back ended up in the dumpster. A scrapper was happy to take as much as he could haul too. At lunch, we heard from Erin Malone, Director of Youth Development for Beyond School and wife of Mike. They give a hand up in education by partnering students with success coaches, who form deep relationships with the families, helping kids get on track for high school. To decrease drop outs, they give individualized academic support, intentional social and emotional support, community service learning and enrichment experiences, along with eliminating as many barriers to education as possible. Erin Malone and success coaches. 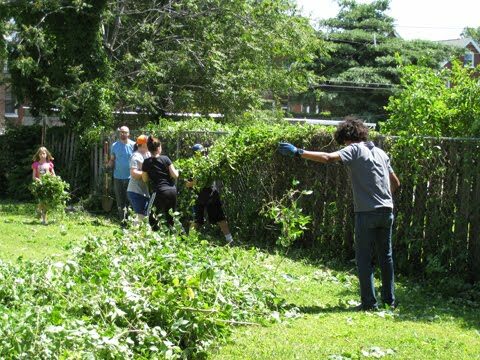 As we learned and worked, students went about their school day, allowing us to see some of the faces we were quietly supporting with our labor. I pray for the success of every one, and through them future strengthening of families and communities. 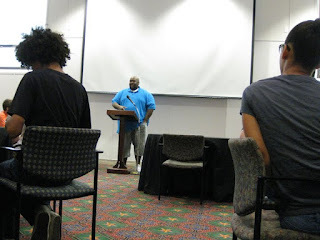 Beyond Jobs Director Jason Watson, known in the rap world as Json, shared his story. An STL native, Jason began selling drugs at 12, was kicked out of school and did some jail time. When he became a Christian at 21, he wanted to help guys with similar backgrounds. He returned to St. Louis 2 years ago and was asked by the former director to work at M:STL. He now works primarily with guys 22-35 who get paired with a mentor and work a paid 8-week internship. If they prove themselves, they're often employed full time. Mentors continue with them for 10 to 12 months, developing authentic relationships. He loves seeing these guys overcome so many obstacles. Jason discussed the need to enter into other people's narratives. Get to know them. Differences between city and county or worship styles aren't right or wrong, just different. Ask questions to understand someone's context and why they feel/think/act as they do. He suggested using the internet to learn how others think, or documentaries and books that give snapshots of people's lives. Better yet, really be with people and do what they do. Racial reconciliation is when you really enter into someone else's world. It's not just a church service with people from different backgrounds, but knowing them in their world. 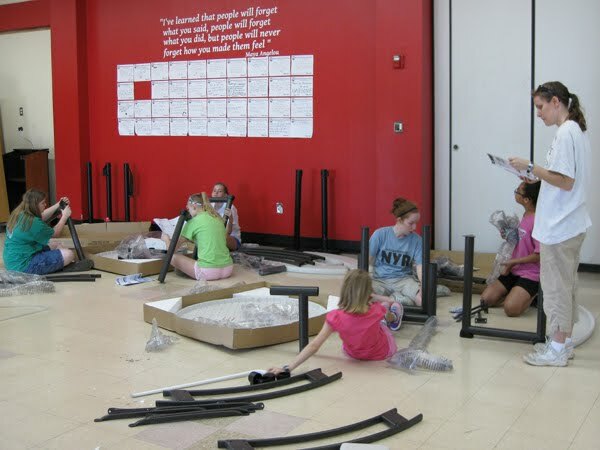 For our work today, we went back and finished up what we could at the school, including the assembly of some rather frustrating tables. Afterward, we toured more of the YMCA building, checking out the former World Impact apartment which they hope will house work teams, and spent some time on the old, elevated gym track. Every bit of that 90K square feet has so much potential, as does every person we encountered, each one created in God's image. Assembling those complicated tables. Or trying to. Hanging out on the elevated track. Those rails just don't seem quite high enough for today's standards. 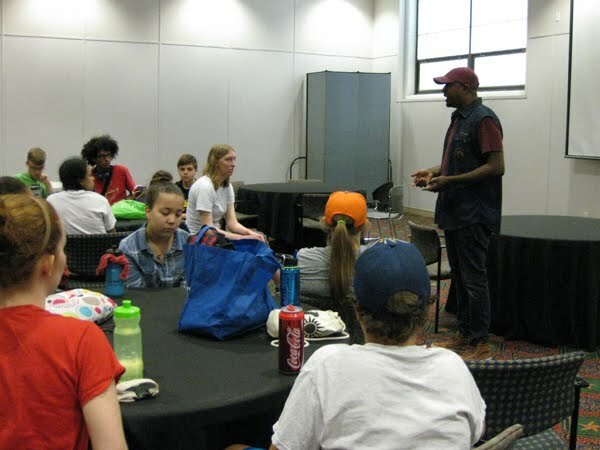 Today we heard from Chris Hill, Beyond Jobs Student Relations Coordinator who serves as Jason's right hand man. 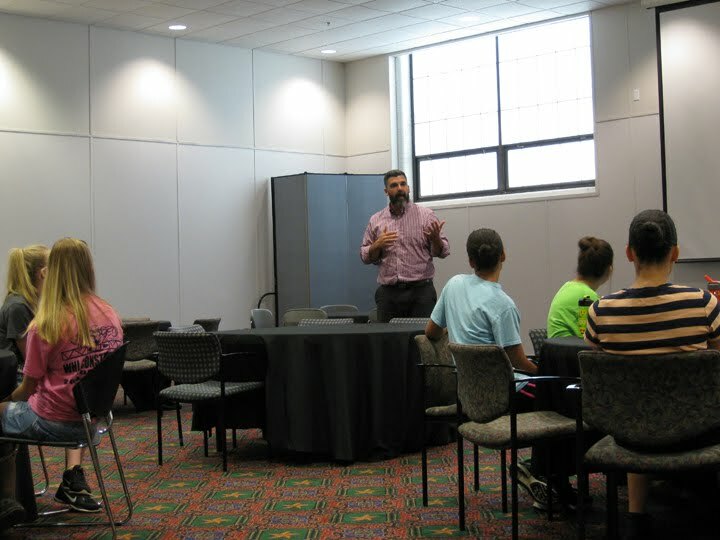 Requested to speak on fatherhood, Chris was hesitant as he approached, but his story was powerful. Having gone from career thief to drug dealer to rapper, Chris explained how Jesus called Him through some amazing circumstances. Now 41, he didn't expect to make it past 25. He said much of what he went through came from not having a father around. He wanted guidance from the man he knew as dad, but got a poor example instead. He hated the man, but obeyed when he felt God saying to tell him he loved him. When he developed cancer, Chris cared for him and they grew close. Chris was able to treat and forgive him the way God had treated and forgiven Chris. He later learned this man was actually his adopted father, and wanted to find his biological dad. Chris located him about 3 years ago and began a surface relationship. They recently reconnected through a deeper discussion, and he was so relieved to hear his dad say he loved and was proud of him. He was hopeful to get to know him better. Sadly, just days later he learned his father passed away. "Honor your parents, cause once they're gone, they're gone," Chris said, reminding us to tell people we love them while we can. He's trying to do right by his own kids now, two of which didn't see him much when they were young either. Don't wait until it's too late to have that relationship. While Chris' story was fresh and painful, it was also full of Gospel redemption. I pray the Lord comforts Chris, using him powerfully in the lives of other men with similar stories who need to know the love of God as Father. This is an important topic, and one of many discussed with guys in the program. 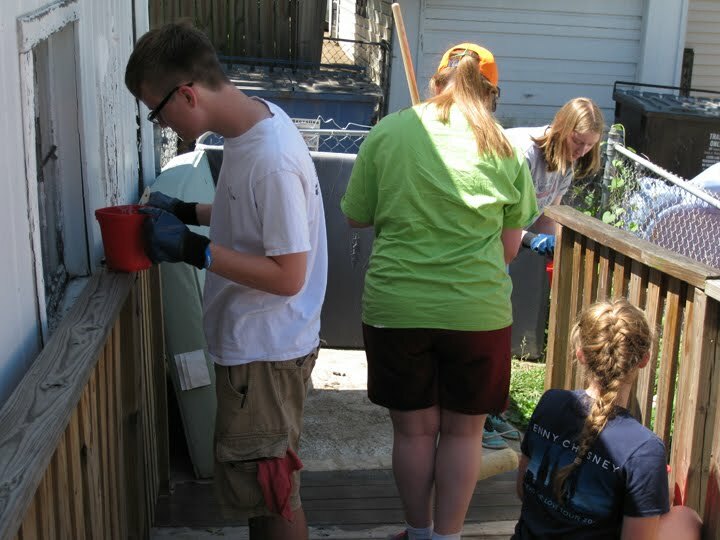 Our work today led us again to the south side. Our team split to weatherproof a couple ADA compliant decks installed by Home Services. 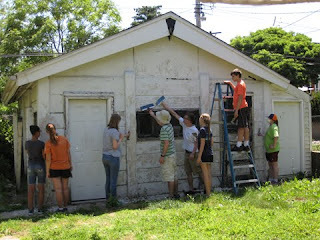 We reunited at a home on Chippewa to scrape paint from a large garage. I spent time with resident JoAnn, learning about her life and living in the area. She said it's not so bad as you hear on the news and she loves the community. She even showed off some of her doll collection. I was thankful to engage in ways Jason suggested the day before. Paint scraping. Another team will paint after us. 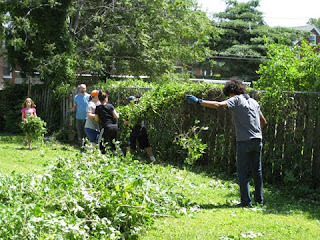 We went straight to work today, picking up trash around the neighborhood, then doing yard work at local homes. It was amazing to see these old, beautiful houses, some in fine shape and others just shells needing to be torn down. Residents told our group much of the issue in this area is the city needing to provide proper services. 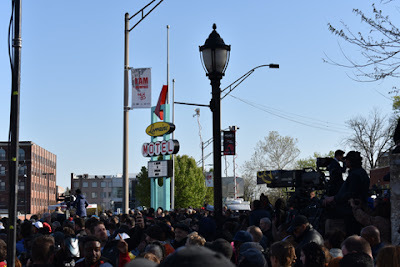 Just days later local media covered a forum for residents to speak on the abandoned building problem and need to remove these structures, which are dangerous and attract crime. A damaged home right next to one well kept. 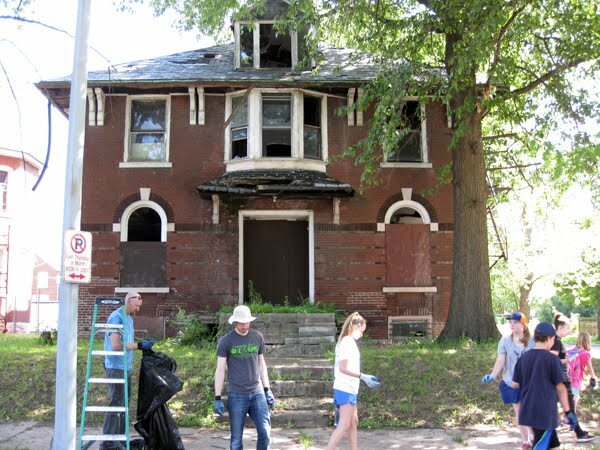 Cleaning the streets in front of a once beautiful home. Tearing out brush along the fence line. And all cleared. This team just knocked tasks out. We got to try some local cuisine at Bing Lau Chop Suey just across the street as recommended by Jason earlier in the week. 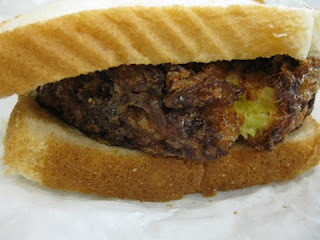 They serve the STL classic St. Paul sandwich, a large egg foo young on bread. Our food guide was also awesome enough to rap for us a Json verse from "Struggle" off his new album "Foreign." We wrapped up our week with a debrief at M:STL and headed home. A St. Paul sandwich. In case you're wondering. Our team spent evenings at four host homes, my own included, and debriefed daily highs, lows and takeaways. We had a more diversified group than one might realize at first glance, with a variety of cultural backgrounds represented, including black, white and hispanic, so it was really interesting to hear everyone's views. The team mostly represented. Some switched out during the week. I'm thankful to have any part in restoration as informed by the Gospel. Jesus died to give us a relationship with God, to make me new and one day make all things new. 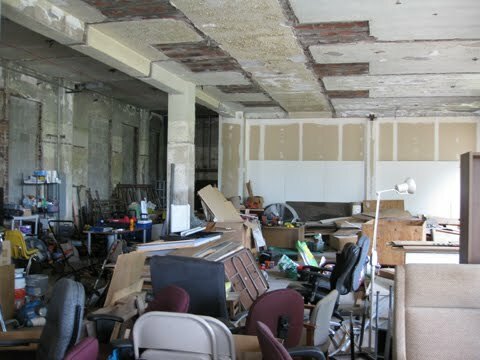 How can I help in working toward the restoration of relationships and places around me now? One way seems as simple as sharing stories like these to help others broaden their own views. Another is to enjoy relationships as the Lord brings them, gladly entering into those narratives, plus watching for ways to leverage God-given resources and gifts to help empower others and meet actual need. 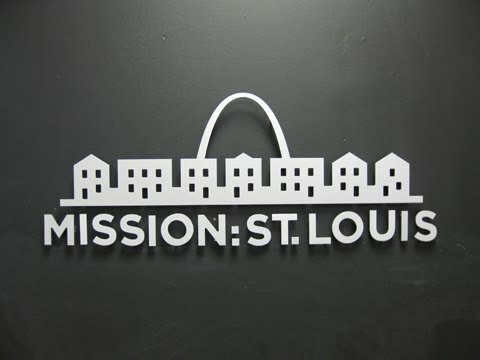 Thanks to Mission: St. Louis for allowing us to serve, connect and learn, and for all they're doing to restore our city.